PRICE REDUCED, GREAT VALUE. Come & Compare. Welcome to this beautiful, immaculate home. No waiting, move in ready today. Built in 2014, home rivals any model. SheaExero energy efficient & 20 yr prepaid solar. Highly upgraded kitchen; raised panel cabinets, soft close drawers, rollouts, stunning granite, & large island w/new pendant lighting; open to dining, great room, & secluded interior courtyard with gas frpl & natural light. Entertainment is a joy in the private back yard. Hear the whisper of your water feature while enjoying Arizona evenings around the rock glass firepit w/circular seating. Covered patio adds outside dining & relaxing seating area w/auto awning & sun shade. Custom built stucco kitchen area is plumbed with gas, elec, & water. The AZ lifestyle awaits you ! Directions: Through main gate at Trilogy. To right (W) on Claret Cup, right on North 129th, Right on Brookhart way, Left on N 129th Ave, Left Crestvale Dr, Right 129th Ln, Left on Roy Rogers, home on right. Please, send me more information on this property: MLS# 5848077 – $525,000 – 12950 W Roy Rogers Road, Peoria, AZ 85383. 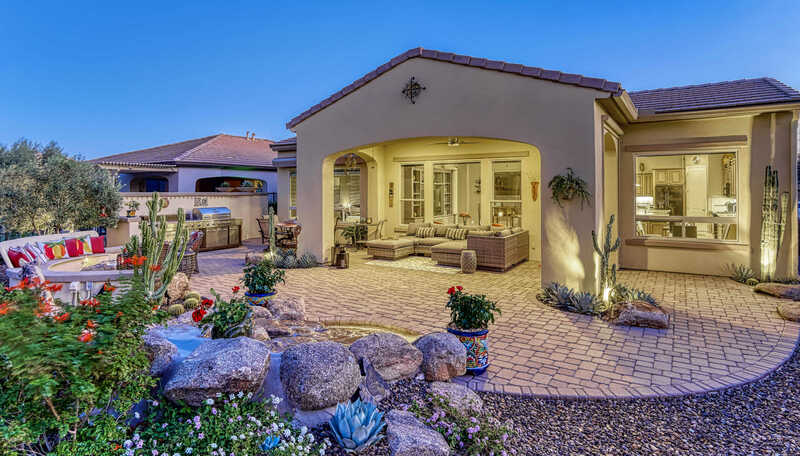 I would like to schedule a showing appointment for this property: MLS# 5848077 – $525,000 – 12950 W Roy Rogers Road, Peoria, AZ 85383.